As a food blogger, I’m always trying out the new and exciting so much so that sometimes my family begs me to “please make something normal for dinner! !” Well, here it is. Just plain old simple, wonderful, normal lemon-herb roast chicken pieces. Ordinary and extraordinary in every bite! YUM!! Other than the chicken and some salt and pepper, there are really only three ingredients at play here: butter, lemon zest and some type of fresh herb—I usually use thyme but you can use whatever you like or even a combo. Since it’s so bare bones (ha ha!) make sure you use the best quality of everything involved—you really want the best of the best to shine through. 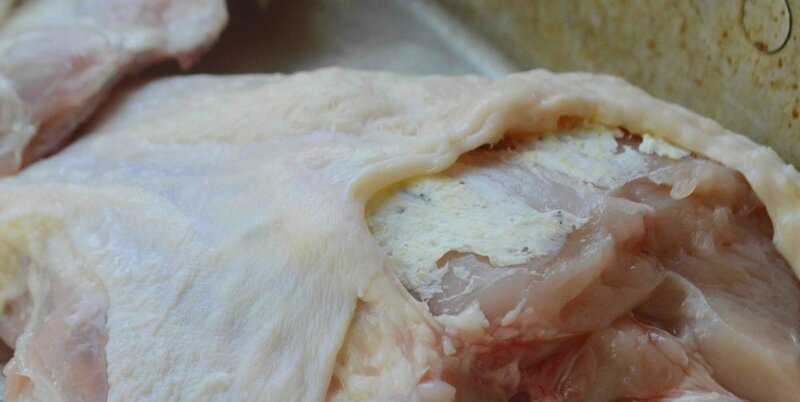 Anyhoo, after you’ve mashed together the butter, lemon zest and herbs, you sort of mush some of it under the skin of the chicken pieces which adds tons of flavor and keeps the meat nice and tender (sorry for the up close and fairly gross raw chicken shot—I just want you to have an idea of what I’m talking about). Once that’s done, you simply season the chicken with salt and pepper, brush with a little melted butter and roast. What emerges is gorgeous—crispy, golden skin with tender meat beneath and the perfect balance between lemon and herbs! The ultimate in comfort food! I guarantee that this will be a favorite whenever you serve it, but it’s particularly satisfying right now on chilly nights. Add in a baked potato and a nice green salad and dinner doesn’t get more delicious! Or more “normal”! The home judges are going to be so relieved!! 1. Preheat oven to 450º F. Place the softened butter in a small bowl along with the lemon zest, thyme leaves and a pinch or two of salt and pepper and mix together well. 2. Place the chicken pieces in a large roasting pan. Use your fingers to kind of separate the skin from the meat without detaching it completely and smush some of the butter mixture on each pierce. Pour the melted butter evenly across the pieces and season with more salt and pepper. 3. Bake for about 40 minutes then turn the oven to 375 ºF and cook for another 30 minutes (or longer) until chicken is entirely cooked through and golden brown. Serve immediately with lemon wedges if you like. Note: Recipe is based on years of tinkering around with chicken and trying to figure out what to do with it to make it seem new and exciting!